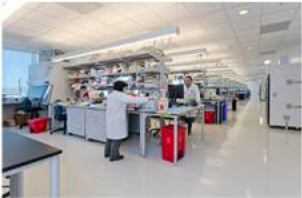 The opening of the Sandler Neurosciences Center research building on the Mission Bay Campus of the University of California, San Francisco (UCSF) promises to be a monumental step toward finding cures for neurodegenerative diseases. The five-story, 237,000-square-foot building houses the UCSF Department of Neurology, the Institute for Neurodegenerative Diseases (IND), and the Center for Integrative Neurosciences. About 100 principal investigators and more than 500 additional researchers and staff work in these clinical and research programs, making it one of the largest neuroscience complexes in the world. For Nobel Prize winner Stanley B. Prusiner, M.D., director of the IND and one of the key champions of the project, the completion of the building is the culmination of a 10-year dream. Prusiner believes that bringing together some of the top scientists in the world to collaborate with one another is a great opportunity for progress in fighting diseases of the brain. For the first time, UCSF is able to house under one roof a cross-functional collection of clinicians and researchers who are all united in a common goal—discovering the causes of and cures for neurodegenerative disorders. The collaborators include clinicians treating patients with neurological conditions, clinician-researchers carrying out brain imaging and drug studies in patients, and scientists who study the molecular and cellular basis of diseases and investigate how the brain normally functions. By working in such close physical proximity, clinicians and researchers are better able to share experiences and expertise, brainstorm, and collaborate. Creating a multi-disciplinary community, including chemists, biologists and physicians, and providing space for long-term collaborations, means there is a greater possibility of developing treatment, and even a cure, for neurological diseases. When designing the IND, it was important to create a space that would facilitate collaboration among the researchers. 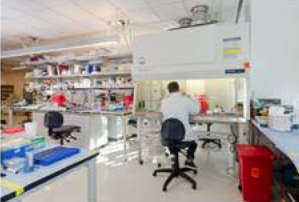 Located on the third and fourth floors of the Sandler Neurosciences Center, it includes 27,313 square feet of Biosafety Level 2 (BSL2) laboratory space featuring 30 rows of open lab benches with a new Class II Type A2 biosafety cabinet at the end of every other bench. The large lab allows for dozens of researchers, as well as their students and research staff, to have enough room to comfortably and safely perform their work while still allowing for collaboration with their colleagues. A long wall of windows adds to the spacious feeling and enhances the environment. While working in the biosafety cabinets, researchers are occasionally able to gaze out the large windows to the beautiful UCSF campus and surrounding Mission Bay neighborhood. 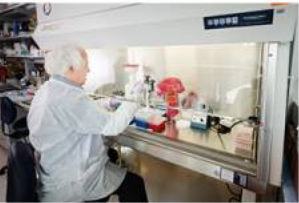 Smaller laboratory workspaces are provided on the interior walls of the BSL2 laboratories, and these include biosafety cabinets, incubators, and other specialized equipment. A spacious Biosafety Level 3 (BSL3) laboratory is also available at the IND. Equipped with Type II Class B2 biosafety cabinets, this is where the researchers work with more hazardous materials. 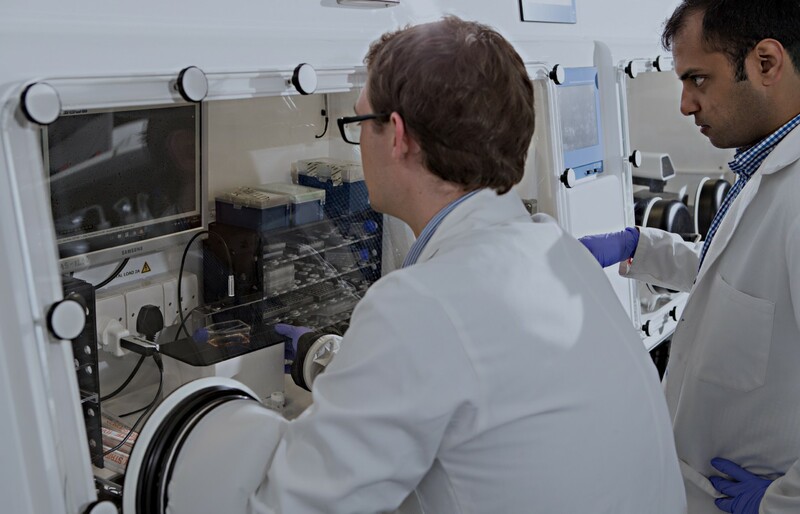 Class II biological safety cabinets are a critical piece of laboratory equipment typically used for microbiological studies, cell culture, pharmaceutical procedures and toxicology. They protect personnel, the research product, and the environment from exposure to biohazards and cross contamination during routine procedures. New biological safety cabinets were provided to the IND by a generous donation from the Eagleson Institute, a non-profit organization working globally to promote laboratory health and safety through education. In a partnership with Baker, who helped with flexible payment terms, the entire laboratory was outfitted with new cabinets. Eagleson provided a generous grant that led to the purchase of 51 SterilGARD® e3 Class II Type A2 cabinets and 11 BioChemGARD® e3 Class II Type B2 cabinets. Based on the latest technologies, they provide energy-efficient operation, industry-leading ergonomics, durability, and safety. “It was important for us to provide the best equipment available, and when it comes to biosafety cabinets, nobody beats Baker. Throughout my career, I have relied on Baker biosafety cabinets to provide the level of safety and protection that is required to make my research successful,” said Prusiner. The donation of the biosafety cabinets was made in memory of John M. (Jack) Eagleson, Jr., who was the president and owner of Baker from 1959 until his death in 1988. The Eagleson Institute was founded in Jack’s memory in 1989. Eagleson came to Baker from the aerospace industry and soon earned a reputation as a pioneer in the development and testing of ventilation equipment. He became a strong proponent of laboratory safety and was a strong believer in sharing information and teaching others. Through formal training and informal discussions, Jack challenged the minds of his employees, customers, competitors and others throughout the industry. 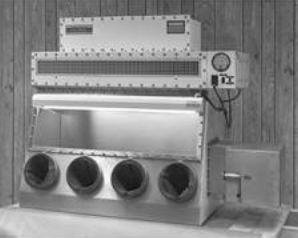 More than three decades ago, Prusiner and Eagleson published a paper together, along with scientists from the Naval Biosciences Laboratory, the University of California Naval Supply Center, and Beckman Instruments Company, presenting their evaluation of a special safety cabinet that housed a high-speed centrifuge. Baker Cabinets at UCSF At the time, centrifuges had been tested thoroughly to ensure no leakage or aerosol generation would occur during operation, but no testing had been done to see what would happen if the rotor of the centrifuge exploded. At the time, Prusiner was working to isolate the causative agent of a virus-like pathogen, now called prions, and assess how it was transmissible. Because little was known about prions, the risk assessment of his experiment was difficult. Ultracentrifugation of the prions would happen at very high speed, and Prusiner saw a possibility for danger. With his long-term commitment to safety, Prusiner assembled some of the best in the business to ensure he would be adequately protected. He contacted Baker to design a Class III biological safety cabinet to hold a high-speed centrifuge supplied by Beckman Instruments Company. Class III biosafety cabinets are gas-tight and designed for use with high-risk infectious pathogens. After pushing the centrifuge to fail (which actually took some intentional weakening by the researchers), it was found that if a failure occurred, it would be highly explosive. In fact, the test explosion actually moved the biosafety cabinet by about three inches. But as long as the explosion was contained within the biosafety cabinet, no hazardous contaminates were released into the environment and a researcher would be protected. Even though their tests showed that the centrifuge cabinet was extremely durable and that catastrophic failure of the rotor would be extremely unlikely, these tests ultimately led to the redesign of the centrifuge cabinet to provide even more safety. Evaluation of a Class III Biological Safety Cabinet for Enclosure of an Ultracentrifuge (M.A. Chatigny, S. Dunn, K. Ishimaru, J.A. Eagleson, and S.B. Prusiner) was published in Applied and Environmental Microbiology in November 1979 (Appl Environ Microbiol. 1979 Nov;38(5):934-9). In the early 1980s, Prusiner discovered that infectious proteins, which he called prions, are the cause of the degenerative brain disease called Creutzfeldt-Jakob disease (CJD). Prions have since been implicated in many neurodegenerative diseases, including Alzheimer’s and Parkinson’s diseases, and most recently, post-traumatic stress disorder (PTSD). Prusiner remains at the forefront of pioneering research on neurodegenerative diseases and was recognized for his discovery of prions with a Nobel Prize in 1997. In 1999, Prusiner founded the IND, based at UCSF, with the ultimate goal of developing cures that will provide relief to those suffering from neurodegeneration. According to the IND’s website, the United States is facing an epidemic of dementia, with Alzheimer’s disease affecting five million Americans. While the human cost is incalculable, the financial burden of caring for these patients exceeds $150 billion annually—and the crisis is spreading. Close to half of the U.S. population who reach age 85 will develop Alzheimer’s disease. Since most, if not all, neurodegenerative diseases are cause by protein abnormalities, the study of prions is likely to lead to the development of effective therapeutics. In its new facility, the IND is poised to make significant strides in the research and development of drugs for these horrible diseases. Baker and the Eagleson Institute are proud to be able to support the IND’s mission. To find out more about the IND and the important work they are doing, visit http://ind.ucsf.edu.